Seth Benz, Director - Schoodic Bird Ecology Lab , has amassed nearly 30 years of experience in conservation science and environmental education leadership. 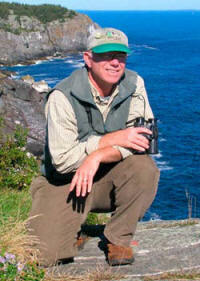 He has guided Road Scholar birding trips in Maine, directed Hog Island Audubon Camp (1999-2008), worked as an island supervisor for Project Puffin, served as Education Director of the Audubon Expedition Institute and as Assistant Curator of Hawk Mountain Sanctuary in Pennsylvania. He is now the director of the Schoodic Bird Ecology Lab, a collaborative field station focused on bird migration, phenology studies, and public participation in scientific research at Acadia National Park. Seth's hands-on work includes raptor and songbird migration research, hawk watching, tern restoration efforts, bird flight altitude and wind energy studies, telemetry of wintering bald eagles, catching migratory peregrine falcons at Assateague Island National Seashore, next box monitoring projects with American kestrel, eastern screech owl, and eastern bluebird, and, ecotourism scouting trips to Peru and Mexico. The Schoodic Education and Research Center (SERC) is one of 20 research learning centers in the United States, and is the largest of all these facilities. SERC is home to the Schoodic Institute in Acadia National Park and is located on the former Naval base in Winter Harbor, Maine, surrounded by the Schoodic Peninsula portion of the park. SERC encompasses more than 20 buildings and over 80 acres of forest edged with rocky coastline. It's a pleasant walk or short drive to Schoodic Point for the world class views that make this national park internationally famous. The campus is tucked into a spruce-fir maritime forest dampened by the cool breeze from the surrounding ocean. Acadia National Park acquired more than 2,000 acres on the Schoodic Peninsula by donation in 1929. At the time, John D. Rockefeller Jr. was working with the National Park Service to help construct the Park Loop Road on Mount Desert Island. The road was designed to hug the coastline and provide access to scenic vistas. However, a U.S. Naval Radio Station at Otter Point stood in the way of the road. At the urging of Rockefeller, the National Park Service worked with the U.S. Navy to move the radio station to Schoodic Point and constructed the five original buildings for the U.S. Navy, including Rockefeller Hall. The new U.S. Naval Radio Station at Schoodic Point was commissioned in 1935 and gradually expanded to meet the demands of World War II and the Cold War. 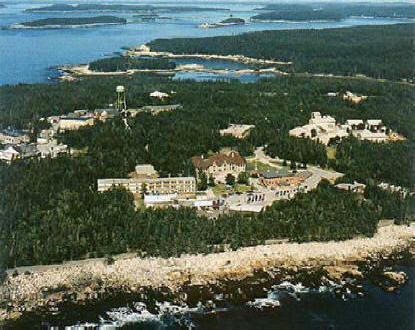 By the 1990s, the renamed Naval Security Group Activity Winter Harbor at Schoodic Point consisted of more than 35 buildings and 350 navy personnel. In 2002, the U.S. Navy closed the base and returned the land to Acadia National Park for use as a research and education center. Lodging Facilities: Two and four bedroom apartments are located in a village-like setting with a playground and picnic pavilion. All units have full kitchens, living and dining rooms. The two bedroom apartments have one full bathroom, the four bedroom apartments have one full and two half bathrooms. Some apartments have laundry facilities.